We Love All Creatures Short and Tall Daycare Service! 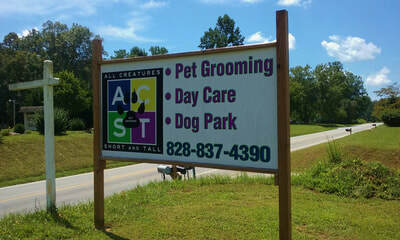 In 2016, we were pleased to hear that ACST was opening in Murphy, NC and would offer Daycare for our dog Callie. Callie has had experience at other daycare facilities and has always enjoyed her playtime with her canine friends. However, we have always been very careful to make sure she was safe and well cared for during her stay. We were very impressed with our first visit to ACST. They are conveniently located in the Peachtree area of Murphy and the facilities and the grounds are clean and beautiful. 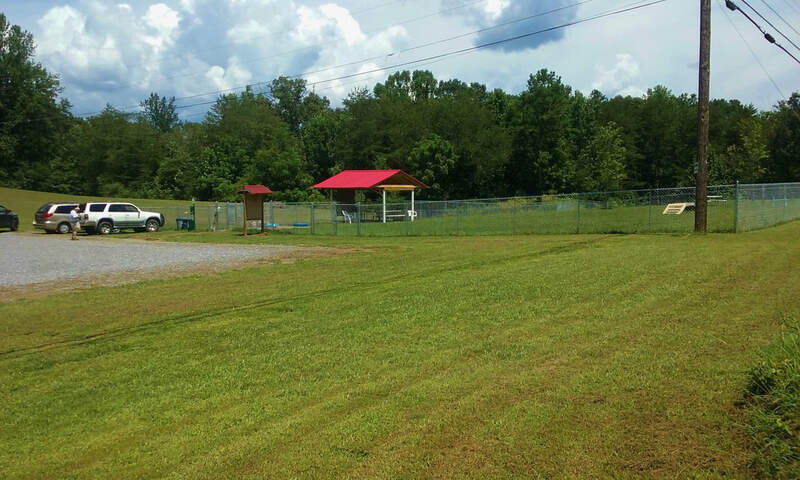 They have large and comfortable indoor and outdoor kennels and the outdoor dog park is very large, clean and well maintained. The fencing is secure, and the double gate system provides a safe entry and exit. The park is sectioned off to allow similar sized dogs to be grouped together. The ACST staff makes the daycare pick up and drop off process quick and convenient and they are always sincerely happy to see Callie and she is always ecstatic to be there. The staff is also very adept at learning a dog’s physical and emotional requirements and they take great care to group the dogs with the most suitable playmates. Activities are always expertly supervised, and the dogs receive the perfect amount of play, rest and love. This is the fourth daycare facility that Callie has experienced, and it is by far our (and her) favorite. We not only have the utmost confidence that Callie is safe and secure at ACST but the love and care that she gets from the staff is unmatched in our experience. Callie loves her time there so much that we frequently take her for daycare even when our schedule may not require it. We cannot recommend ACST highly enough! Since the beginning when it started out in a little hotel building, we have been with ACST. There have been many changes through the years but by far the best is the new facility. The new building is large and bright, always clean. Now that my dog is a senior I like the fact that the groomers have their own quiet rooms, so as not to put extra stress on her. We also take advantage of the Day Care every week with our puppy. Plenty of indoor and outdoor fun for her. It's her favorite day of the week. We hope that Anna can grow up at ACST just like Marina did. The outside dog park is so pretty...always so nicely maintained. This park was laid out right. We especially like the safety entrance gate. Anna always enjoys playing in the park with all her doggie friends she has made at ACST. The way Katherine and her staff work hard to help the rescues is also dear to me. Thank you to Katherine and Staff for giving such love and care to our critters. ​Thank you for your interest in All Creatures Short and Tall, Inc. Since opening in August of 2010, we have grown from a one-person grooming operation to a fully staffed grooming and daycare facility which offers the only dog park in the area. This is a profitable turn-key operation as it stands today, but has tremendous growth potential should one choose to add overnight boarding and training to the list of services. Our reputation is excellent and our customers appreciate the individual care and supervision we provide. In fact, our growth over the past 7 years has come almost exclusively from word-of-mouth advertising. We receive referrals not only from our happy customers, but also from other professionals such as local veterinarians, pet store owners and managers, and the Cherokee County Chamber of Commerce. Our reviews on social media and search engine sites such as Google consistently rank in the 4.5 to 5- star range. Our location is one that is easily accessed from several directions. We are just a few miles from downtown Murphy, NC, and only a half mile from the local hospital, community college, two veterinarians, and Moog Components, which is one of the largest employers in Cherokee County. 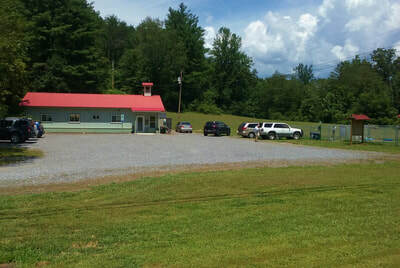 We have extensive frontage on a busy two-lane highway and have excellent visibility from the road. Our parking lot is large and level, making it easy to navigate for our customers, particularly the seniors who make up a large portion of our clientele. * We are situated on 7 beautiful acres of rolling open land in front and slightly steeper wooded area in the back of the property. ​The wooded space has a perfect home building site with hundreds of linear feet of frontage on Peachtree Creek (which is about 30 feet wide), mature hardwoods, easy access to water and power service, and a spectacular view of pristine pastureland with mountains in the distance. This is a mixed-use area with no zoning restrictions. The property and building were recently assessed at $224,490 for tax purposes. ACST was recently honored with the 2017 Readers’ Choice “Best Pet Groomer / Pet Services” award from the Cherokee Scout and Andrews Journal newspapers. While we do have competition from a few skilled groomers, most of them work alone and no longer take new customers. In fact the largest competitor we have had in recent years has decided to start a mobile grooming service and is sending many of her existing customers who do not want to use a mobile service to us. We have a number of recurring grooming customers who have already scheduled their appointments for 2018 and have more than $40,000 worth of work pre-booked as of Fall 2017. Our dog park is the only one of its kind in a four-county area. As many of the residents here have come from cities and towns that offer the safety and convenience of an enclosed area for their pups to run, we have received an enthusiastic response from the people who have joined so far. Members are issued a proximity card that allows them access to the park seven days a week. The enclosure is divided into two parts, the smaller of which is dedicated to small dogs. We have water spigots on both sides and a pavilion which straddles the shared fence line, offering shade and shelter. We have planned for future growth of the park, and in the first several months of operation we planted 3 maples (close to 20 feet tall now) which will provide shade and a natural aesthetic in the years to come. Our day care services include closely supervised socialization, play, and exercise activities. We take advantage of the wonderful resource the dog park offers and pups go home tired and happy to their grateful owners. ​All financial information can be obtained upon receipt of an executed non-disclosure agreement. If you would like to pursue this line of inquiry please email Katherine Taaffe, owner of ACST, at KatherineTaaffe@gmail.com or use our Contact tab on this website. The financial packet contains forecasts as well as historical data. You will find three projections for 2018, one for keeping things as they are now and two for if a new owner decided to incorporate boarding services. One scenario uses the existing building while the other imagines new construction dedicated to boarding. There is absolutely no doubt that a nice boarding facility would be fully and completely supported in this location. There is very little competition in the area but huge demand. We offer a profitable, turn-key operation with a great reputation, beautiful facility, and a sound plan for future growth options in both revenue and, more importantly, profit. We've done the most difficult work already with completed and fully functional facilities and a strong and recurring customer base. The business of helping people care for their pets has its own intangible reward. With this venture you get the best of both worlds.